At Bina Puri, employees are our most valuable asset. Thus, we look after their welfare through our dedicated programmes and activities for their loyalty and effort towards the success of Bina Puri. One of our staff welfare programme was the Undergraduate Scholarship Awards, which is designed to recognise academic excellence among staff’s children at local and foreign universities. In the meantime, we also gave cash incentives to staff’s children who excelled in their SPM, PMR and UPSR examinations. For our staff, those who excelled and successfully completed their studies in Diploma, Bachelor, Master or PhD were also rewarded under the Bina Puri Education Incentives. Other programmes designed to appreciate our staff include the Best Employee Awards, birthday celebrations, festive celebrations and others. In promoting a healthy lifestyle and to strengthen staff bonding, many activities were successfully executed by our dynamic and energetic Kelab Sukan & Sosial Bina Puri (KSSBP). 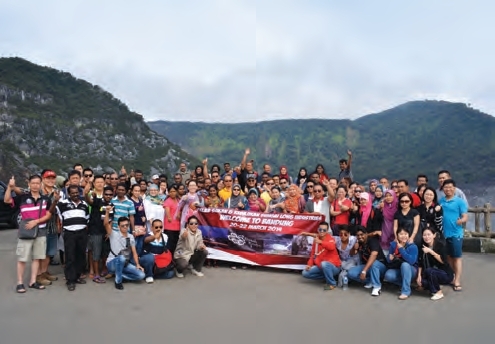 In 2013, the club organised outings to Hatyai and Songkla in Thailand, Bandung in Indonesia and Kunming in China. Other activities organised include futsal tournament, badminton and ping pong tournaments, fishing competition, paintball, Mount Kinabalu climbing and many others. For the construction industry, we have taken the responsibility to ensure that all our staff as well as the subcontractors abide by the Environmental Policies ensuring all waste at the work site are properly collected and stored; for instance the used oil drums are relocated into the oil storage area while the contaminated soil are cleaned up according to the Environmental Quality (Scheduled Wastes) Regulations 2005. Our project team has always put their effort to ensure our project sites are in good housekeeping condition and clean. For instance, maintaining the cleanliness of public drainage. This exercise is performed on a weekly basis mainly to prevent a clogged drainage system that can cause flash floods and infectious diseases. Thus, Bina Puri has always committed to continue its effort in helping to protect the environment.